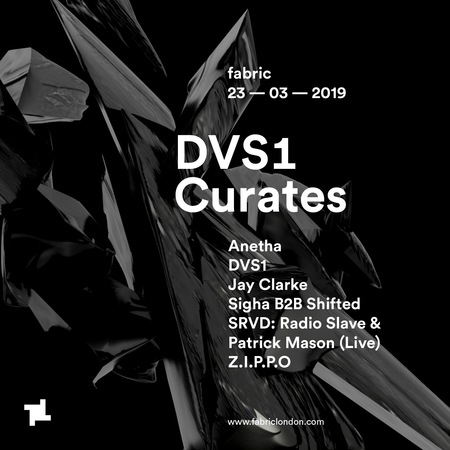 DVS1 curates. Since his early days of throwing warehouse raves across the Midwest USA, through to joining the coveted Berghain family and becoming a regular within our own space, Zak Khutortesky has become one of techno’s most dexterous artists. This March, he joins us for his second Curates session alongside some of his own invited guests. Two outright experts in grainy techno, UK producers Sigha and Shifted go head-to-head. After making their collaborative debut on REKIDS last year, Radio Slave and Patrick Mason join forces for a live performance as SRVD. Khutortesky also invites Anetha, the Parisian selector whose love of vintage 90s rave has seen her releasing on the likes of Work Them and Blocaus Series. Another regular at Ostgut Ton’s hallowed late night space and in Farringdon, Jay Clarke also lands. Finally rounding off the bill is Z.I.P.P.O, whose label Fides has made him one of Italy’s most established voices in recent years. These invited artists line up alongside DVS1 performance for a night showcasing the full strength and depth of his artistic flair. Artists / Speakers: Anetha, DVS1, Jay Clarke, Sigha B2B Shifted, SRVD: Radio Slave & Patrick Mason (Live), Z.I.P.P.O. Entry before 12am: GBP 15.00.